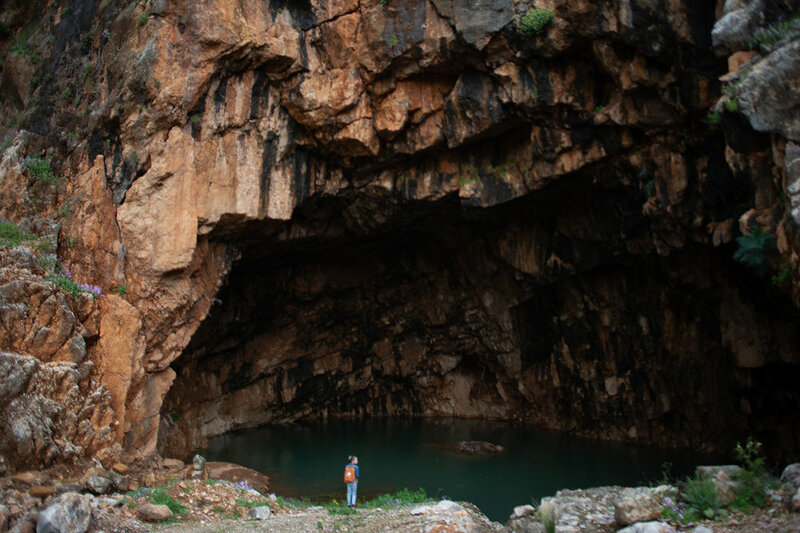 Caesarea Philippi is about a 2 1/2 hour drive from Tel Aviv and straddles the borders of Israel, Lebanon and Syria. I imagine that there is no more gorgeous time of year to visit it than spring when it is green, lush and quiet. It was once a Roman city built around 20 BC and there are many ruins still standing to explore on a visit. Our favorite part was this huge cave where they supposedly performed ancient sacrifices. Caesarea Philippi sits on a spring that feeds into the Jordan River and it is just beautiful. We walked around on a short path that took us by gushing waterfalls, ancient ruins and even some orange trees. The day was overcast, but it was still beautiful. Tessa found this interesting stick and brought it home. It hasn’t left her side since. She loved walking along the walls and looking for tadpoles in the ponds formed in the ancient ruins from the crazy rains we’ve been having the last few days. Next, we drove up the street to Sa’ar Falls and seriously can you even believe this place? I think I imagined Israel as more desolate and desert-like but I’ve been so surprised by how lush it is- we have seen some incredibly gorgeous things while living here and this one ranks right near the top. The falls were huge! The girls loved exploring, climbing and running around all over this area. These two are always up for an adventure and followed their Dad onto a closed, muddy trail to the foot of the falls for a closer look. The flowers are blooming everywhere right now and it makes me so happy. The lilies of the field (red poppies) are everywhere and they are stunning and stop me in my tracks every time. From Caesarea Philippi, we drove south to Galilee making a stop at our favorite place, Eremos Grotto. The setting here just above the sea simply cannot be beat. Its peaceful, lush, and has perfect views. 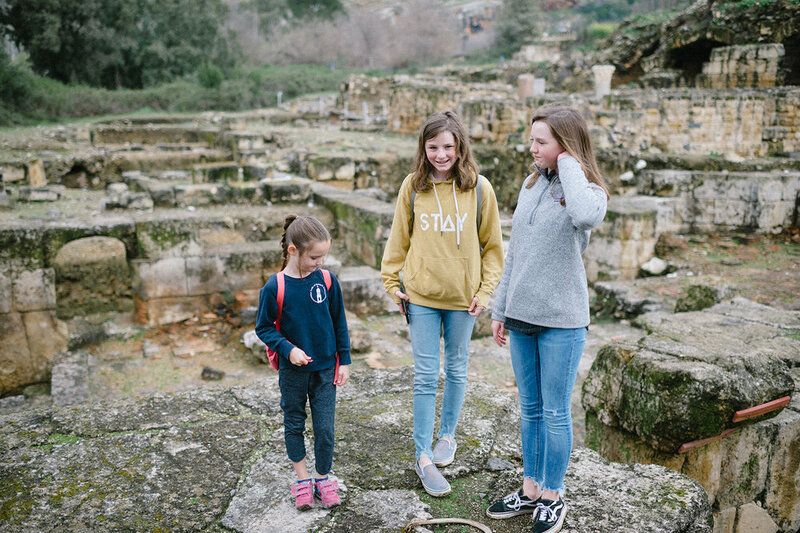 We’ve held several Come Follow Me lessons here as a family and have learned to appreciate every square inch of this part of Israel and its significance in the life of Christ. I don’t think a single place in Israel (outside of Jerusalem) has meant as much to us. We talked more about the Beatitudes and the Sermon on the Mount- literally where it took place. Physically immersing ourselves in the place where these events took place is something we we will never, ever take for granted. And I cannot state how strongly I feel about how gorgeous this time of year is. The hills and valleys around the Sea of Galilee at sunset are unreal. Its no wonder that Christ spent so much of His life here. We’ve taken a few bunches of flowers from this favorite spot and pressed them at home and hope to keep them forever. Just the same hope I have for the feelings we felt in this amazing place.